Every day in April 2017 at Petit Park in Granada Hills, California, Kevin Lenik hurled upper-90s fastballs into a rubber tire roped onto a chain-link fence, his makeshift strike zone. His two closest friends and housemates -- older brother Chris Lenik and Quan Tran -- stood nearby and rolled the baseballs back to him like workers on an assembly line producing pitches. The thump of the ball against the rubber meant Lenik hit his spot on the edges of the strike zone. The clang of the metal fence represented a pitch that was either too hittable or outside the zone. Fresh from being released by the Rangers at the end of March, Lenik threw at the tire to stay sharp for the next opportunity, whenever it might come. It may seem odd for someone with professional experience to resort to using a metal fence as a de facto catcher in a neighborhood park, but for Lenik, who's scratched and clawed for every chance he's received in baseball, it made perfect sense. "That was just humble beginnings," his brother said. "You can never be too good for a public park, I guess." Fast forward 15 months and Lenik is pitching in another public setting. But it isn't that sound of a baseball thumping against a rubber tire that provides him satisfaction anymore. It's the sound of his power sinker slapping against the catcher's glove in the Pacific Coast League. The 26-year-old's journey to become a reliever with the Omaha Storm Chasers -- Triple-A affiliate of the Royals -- has been anything but typical, involving long-odds tryouts, nightmarish hotel stays and a facial injury. Now, having already twice overcome probability to get a chance with an affiliated club, Lenik is on the verge of something greater. It's not just a chance, but the chance. The one Lenik's has been chasing since he decided to pursue pitching nearly three years ago. The chance to pitch in The Show. After his freshman year at Bishop Alemany High School in the Los Angeles suburb of Mission Hills, Lenik stopped playing baseball -- mostly because his father's troubles with alcoholism intensified and complicated the boy's relationship with the game. Lenik pivoted to football, where he earned all-league honors at tight end and received interest from Division I and Division II schools, but failed to qualify academically. He wasn't interested in playing football at a junior college, so Lenik picked up baseball again. He enrolled at College of the Canyons in Santa Clarita, California, and was an outfielder. He transferred to Division II Hawaii Pacific University in Honolulu and wrapped up his final season of eligibility at Cal-State Dominguez Hills, where at the end of the season he experimented with pitching out of the bullpen. Lenik threw 10 1/3 innings and allowed two runs -- one earned -- for the Toros. And just like that, his college career ended in 2015. He was close to hanging up the spikes up for good to settle into a day job in the Los Angeles area, but deep down, he felt like his pitching career was just beginning. A friend from his stops at Hawaii Pacific and Dominguez Hills, Brian Nostaja, connected Lenik with legendary pitching coach Tom House, who began training the right-hander three days a week. He filled the rest of his time by lifting weights, running, working at a friend's gym and driving for Uber. His velocity slowly ticked up and by January 2016, House found him a roster spot in the California Winter League in Palm Springs. A scout saw Lenik pitch there and invited him to an open tryout at the Rangers Spring Training complex in Surprise, Arizona. Out of roughly 120 participants at that tryout, Lenik was the only player Texas signed. He showed impressive velocity with Class A Short Season Spokane that summer, but his lack of polish caught up to him. He posted a 5.17 ERA in 17 appearances. One morning at the end of the following March, he entered the clubhouse during spring camp and didn't see his name in the list of the day's pitching groups. "The moment I realized my name wasn't on any of the groups, somebody tapped me on the shoulder," he said. "And he was like, 'Can we speak with you?' And in that moment, my heart just dropped." Jayce Tingler, the Rangers' assistant general manager of player development, thanked Lenik for his contributions and wished him well. He was being released. But Tingler also confided in Lenik that he had potential and should keep trying. "I knew I belonged," Lenik said. "I'm grateful they gave me the opportunity to see inside the clubhouse and show me my talent is deserving to be here. "That's what kept me going." Lenik carried a trash bag filled with his belongings out of the clubhouse at the Rangers facility, stuffed the bag in the trunk of his 2006 Chevy Impala and drove to Mission Hills -- his home and his place to reset. He went back to pitching at Petit Park right away. In between lifting weights and his throwing sessions with the rope-tire contraption, Lenik worked with his agent to scour the free agent market. Ron Biga, whom Lenik knew from the California Winter League, was managing an independent baseball team out of Crestwood, Illinois -- the Windy City ThunderBolts. Lenik asked him if there was a spot for him. When he joined the ThunderBolts for the 2017 season, he figured he'd only be there for a couple outings, just long enough to get in front of scouts from an affiliated team. But Lenik made 11 appearances, compiling a 3.48 ERA. Each successful outing inspired hope, but each time the hope dissolved as no offers materialized. In the meantime, the tribulations of indy ball began to wear him down. The very low pay and tiny crowds were a far cry from his experience even in affiliated short-season ball. He was running to and from the ballpark every day and filling his free hours with towel drills, workouts and yoga, but his efforts seemed to be leading nowhere. After one three-hour bus ride, Lenik checked into an O'Fallon, Missouri, hotel room that nearly broke his spirit. The beds were unmade, the bathroom was in a disgusting state and bugs crawled around the ice machine in the hallway. The next day, Lenik sent his older brother a text. He was contemplating coming home to Mission Hills. "He said, 'I think I'm going to hang 'em up, man," Chris Lenik recalled. "'I'm throwing high-90s. I'm doing exactly what I need to do and no one's calling me. No one's making calls. No one comes and watches us.'" The older brother replied that Lenik should be proud of himself no matter what happened, but he also sent encouragement in the form of an illustration he found online. It depicted two men with pick axes. One of them was walking away from his work site in frustration, not realizing he was one hack away from finding diamonds. "I said, 'Bro, you're so close. You don't know what would happen if you took one more swing,'" Chris Lenik remembered. The younger Lenik kept going. He spun a scoreless inning on June 9, having no idea that a scout was in the stands. The righty was summoned to Biga's office just two days later and told to pack his bags. Lenik joined Kansas City's rookie mini-camp in Surprise and was subsequently assigned to Rookie-level Burlington on June 19. He threw five scoreless innings there over two outings and was promoted to Class A Lexington. But he wasn't long for the South Atlantic League, either. When the team was in Charleston, West Virginia, for a three-game series with the Power at the end of July, Lenik heard a knock on the hotel room door at 1:30 a.m. His roommate, Andre Davis, opened the door. Legends manager Scott Thorman strolled in and asked, "Lenik, how does Triple-A sound?" 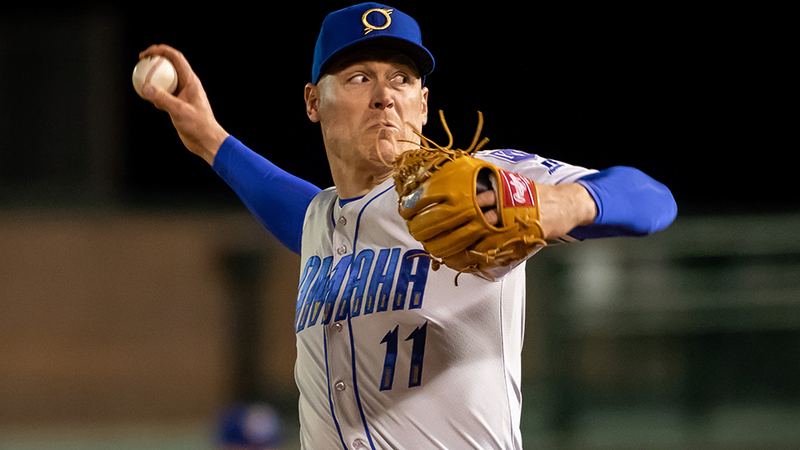 Since being released in March, Lenik had pitched his way through independent ball and two lower levels to reach the highest rung on the Minor League ladder. "How are you supposed to tell someone that and expect them to go back to sleep?" he said. "I didn't go back to sleep that whole night. I tossed and turned." He boarded a 6 a.m. flight and joined Omaha in El Paso. When he walked into Southwest University Park -- the biggest stadium he'd ever been in as a player -- he was in awe. "The stadium, the facility, the spread, everything," Lenik said, "I was like, 'Oh my God. I'm really in Triple-A.' They told me, 'Be ready. You've got three innings today, at least.' I was like, 'I don't care if I pitch the whole game. This is awesome.'" Lenik had been called up alongside Justin Camp to eat a few innings, and they both understood it was a temporary promotion. After twirling 2 1/3 one-hit innings in his PCL debut on July 24, Lenik began gathering his things. He saw someone hand Camp a travel itinerary -- the Auburn product was being assigned to Class A Advanced Wilmington. Lenik held his hand out, wondering where he was going. He was told he was needed for another outing. His next time out, he tossed a scoreless inning and was told the same thing. This cycle continued for about a month and a half until the Omaha staff said Lenik was staying for good and he could have his belongings shipped from Lexington to Omaha. His teammates with the Storm Chasers were impressed from the first time they saw him pitch. "He has a very hard sinker, so that's going to play anywhere, mixed with deception," said Omaha reliever Eric Stout. "The first time we saw him throw, we were shocked. ... He threw well enough to stick around and continue to prove that he deserved to be there." "I should have thrown the slider." Lenik was rushed to the hospital and discharged the next day, hopping on the next plane to Kansas City for further X-rays. It was determined his injuries did not require surgery, which would have cost him his opportunity to participate in Major League Spring Training as a non-roster invitee. Healthy, he found himself throwing next to Kelvin Herrera and watching Mike Moustakas hit in batting practice. He compiled a 2.53 ERA over 10 2/3 Cactus League innings this spring. "It was awesome. It was just another step to where I want to be and where I want to go," Lenik said. Lenik broke camp with Omaha, but his success from last season hasn't carried over completely. Perhaps it was Triple-A hitting adjusting to him, but Lenik believes he was pressing too much this season. "I wanted to get [to the Majors] so bad that I was doing too much and I would overthrow and not throw strikes," he said. "I was just trying to do too much and care too much and put all your heart and your passion into it, and you really just need to step back sometimes and be thankful for where you're at and the opportunity and, really, just take it easy." He has a 4.36 ERA over 33 innings across 23 appearances. His meteoric rise through the system may have left him a bit unpolished for the level, but he's working on that. "He's got an idea," Storm Chasers pitching coach Andy Hawkins said. "He's got a lot to learn about getting hitters out, but he's doing well. He's a pretty good athlete, and he has to work on his delivery all the time, because it can get out of whack pretty quick. But overall, he's a hard worker, he retains and he's got a good attitude. He's the kind of guy you want to work with every day." And he hasn't lost sight of what this opportunity means. When Omaha players visit the children's hospital or spend time with the Boys and Girls Club, Lenik is visibly excited to be there. "I think he sees himself in those little kids growing up, enjoying the game and playing and having the aspirations of playing in the Major Leagues," Stout said. "That's what he had, and now that he's so close, I think he can realize it now just having so much success last year and just starting to get the ball rolling this year. There's a lot of opportunity for him." Every time Lenik finishes an outing, he points to the sky in gratitude. It's an acknowledgement of everything that allowed him to be on the mound in the first place. "But something deep down inside me told me I had a shot."